Luxeon LED powered sabers are nothing new. As a matter of fact, Star Wars enthusiasts have been building them since long before the Master Replica lightsabers hit the market. Throughout these sabers’ lifespan, we’ve seen numerous improvements to LED technology and blade designs, many of which have been intended to maximize the brightness of the prop to replicate the movie sabers as closely as possible. However, within the last few years, development in this space seems to have greatly accelerated. In 2015, a saber enthusiast who goes by Photonic Bladesmith on the FX-Sabers forums came forward with a revolutionary new blade design. 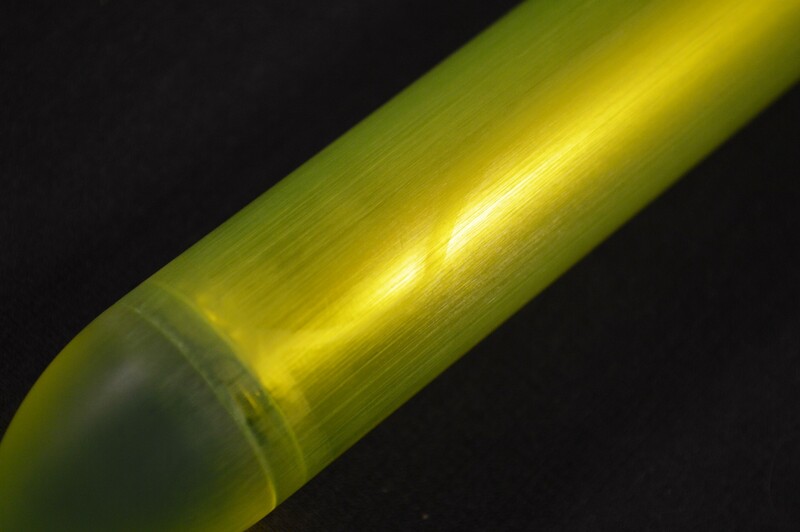 Using green fluorescein dye that reacts with blue light (495 nm being the ideal wavelength), Photonic Bladesmith managed to create an acrylic blade that glows bright greenish-yellow when illuminated with a blue LED. Dubbed the Photon Blade, this development was revolutionary enough to capture the attention of the folks at The Custom Saber Shop and Vader’s Vault. After additional, joint R&D, TCSS and Vader’s Vault released polycarbonate versions of the the Photon Blade late last year. My Ultrasabers Initiate LE V4 rocking the Photon Blade. The saber is off in this photo. 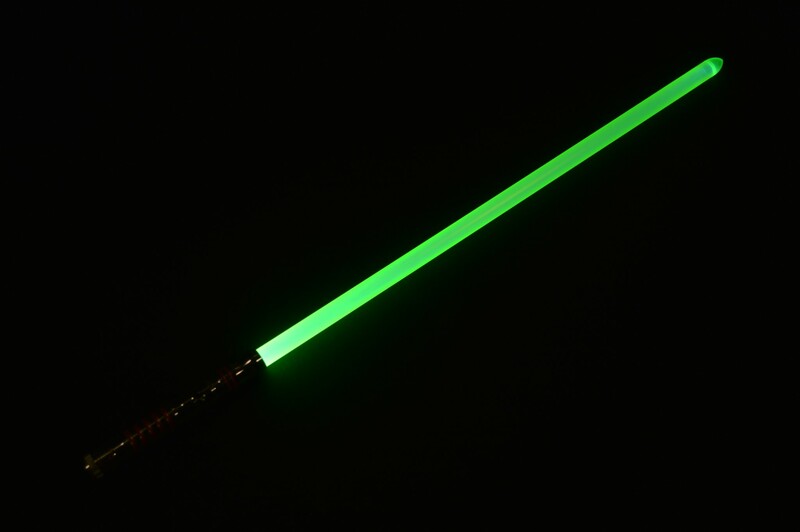 You’ve probably heard some people say that the Photon Blade is a way to turn a blue saber into a green one. This is partly true and partly false. Yes, the blade does absorb blue light and release it as a greenish aura. 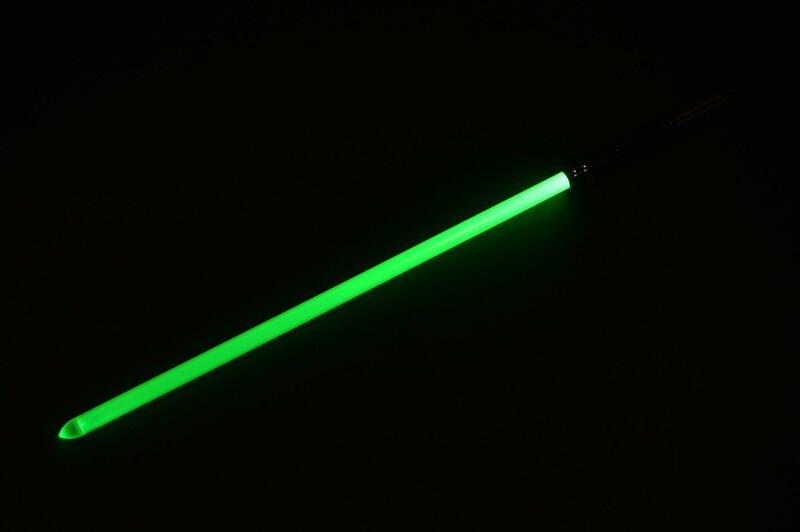 However, the Photon Blade’s green isn’t anything like the color seen in any of the Star Wars films. In fact, the color is much more complex and some people have even called it “Rakghoul” green, after the chemically-mutated inhabitants of Sith-destroyed Taris. This is an accurate shot of the Photon Blade’s color. Note the cyan core. 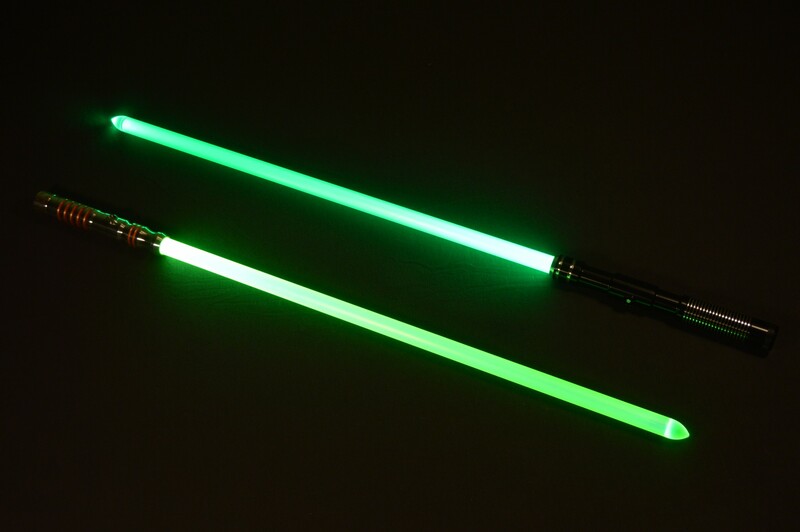 The Photon Blade on a blue saber is at the bottom, while Vader’s Vault’s Dual Diffused blade on a green saber can be seen above. Note the yellower hue of the Photon Blade. 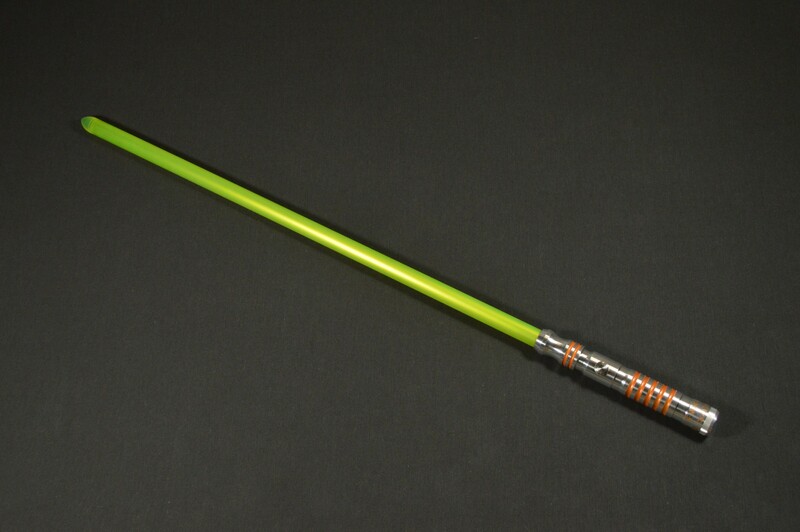 At the edges of a blue-excited Photon Blade, the saber’s color is a very bright green-yellow that is not totally unlike the color of Ahsoka Tano’s shoto in The Clone Wars animated series. Then, moving into the center of the blade, a sort of “coring” effect becomes obvious. 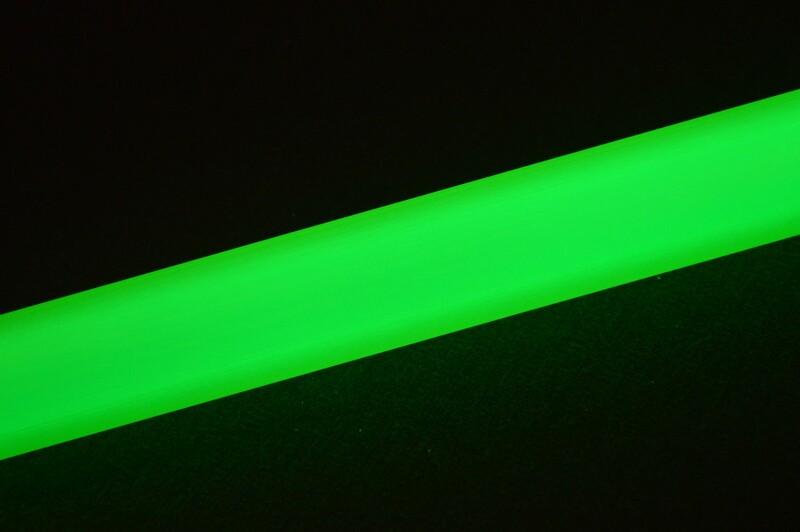 When powered by my Ultrasabers’ Guardian Blue Initiate, the core of the Photon Blade exhibits a bright green color that also has tones of cyan. The bluing of the core also seems much more noticeable closer to the blade’s tip. To be honest, I initially thought the cyan core was somewhat disappointing. Based on most of what I had heard, I was expecting a greener tone to the Photon Blade’s color. Now though, I’ve grown to like the unique color. Shining a blue light on the Photon Blade really lights it up. 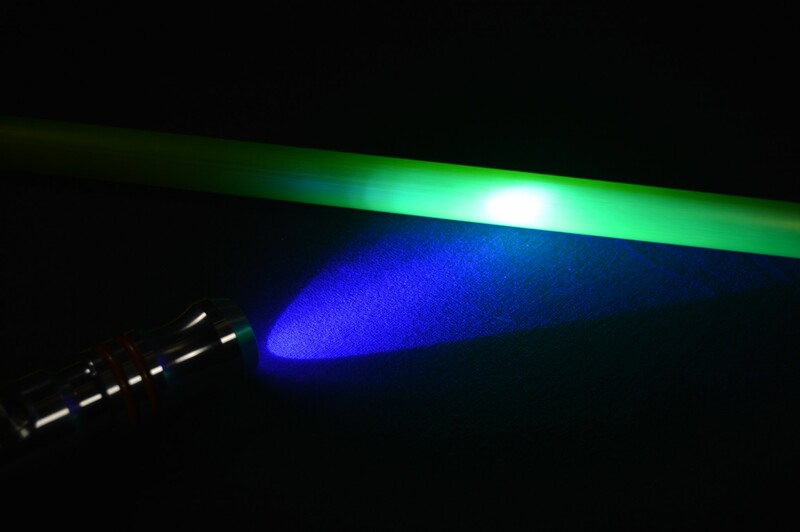 The reason the Photon Blade’s core looks somewhat blue has to do with the thickness of the blade’s walls and the concentration of blue-sensitive fluorescein dye. For this review, I selected the thin walled, display version of the blade. This makes for a brighter blade, but it also makes it less efficient with respect to blue light absorption. 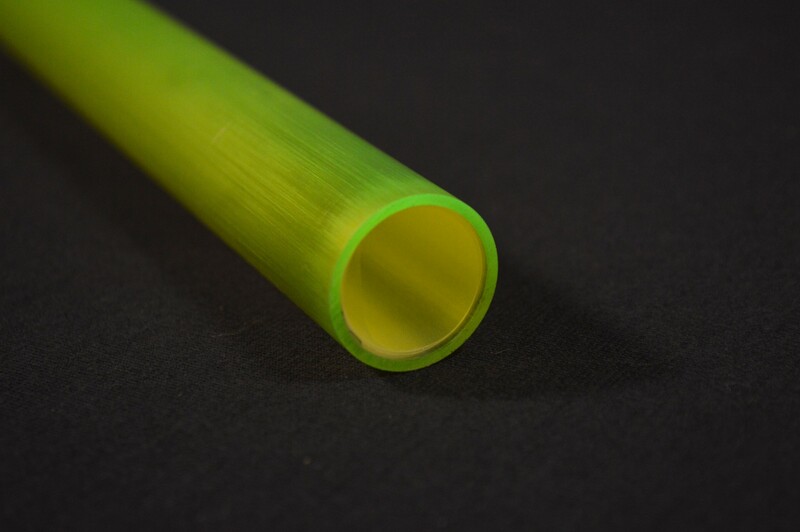 In order to achieve a truer green, Vader’s Vault could increase the dye concentration in their polycarbonate extrusions or buyers can select their thick walled version, which naturally houses more fluorescein. Note how some of the blue light shines through here at the tip. This is because the reactive dye does not fully absorb the LED’s light. A thicker blade or higher dye concentration would “fix” this. Also, the bullet tip on the Photon Blade is one of the least noticeable tips I’ve acquired yet. While blue light sources produce the most striking results with the Photon Blade, other colors can generate interesting effects. In my experience, the blade works nicely with green LEDs as well. 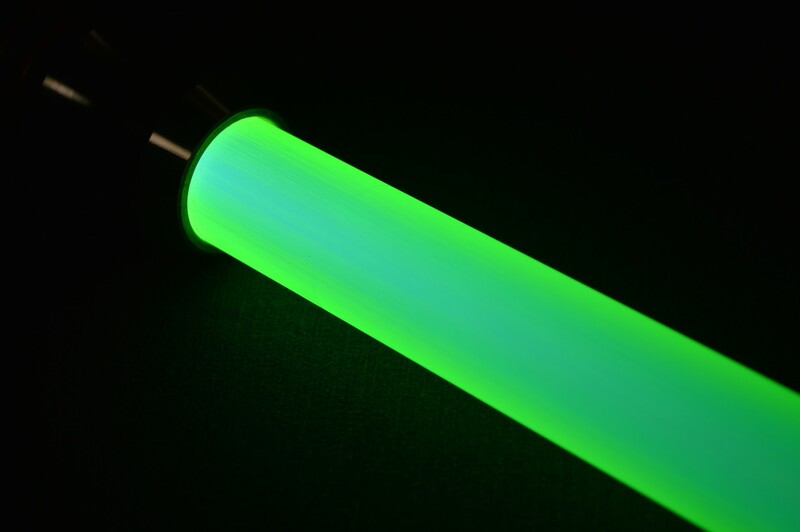 While it does not drastically change the color of a green saber, using the Photon Blade with a green LED results in a bright lime-green saber that is far less susceptible to washing out in well-lit environments. In fact, sunlight can help to make the Photon Blade a bit brighter. In this way, the Photon Blade makes for an excellent green day blade. 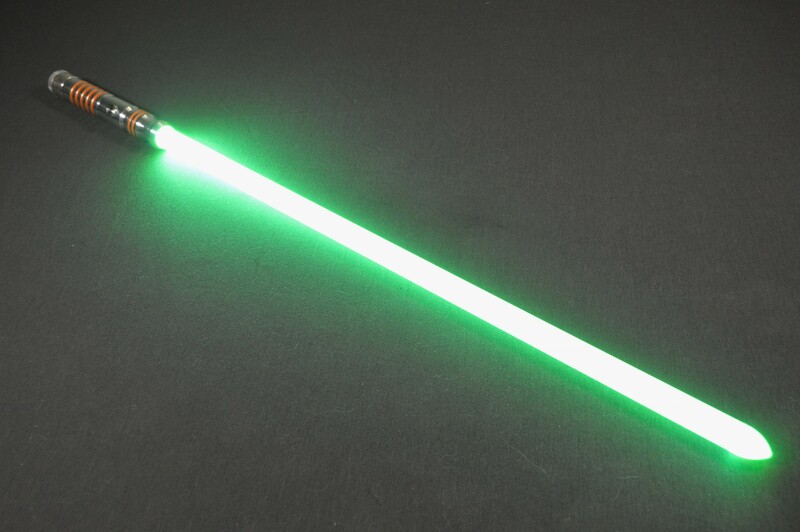 Here is the Photon Blade on a green LED saber. It still looks pretty darn good here. 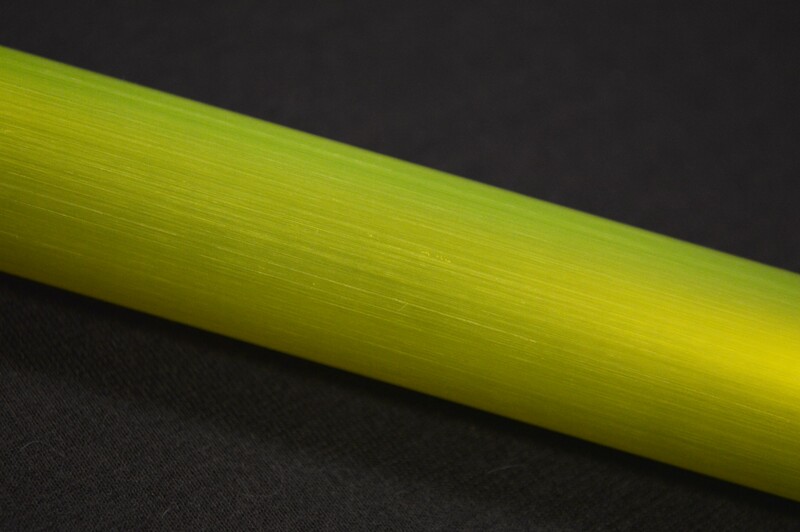 A closer look at the green-yellow blade produced by putting the Photon Blade on a green saber. To aid with light diffusion, Vader’s Vault sands the outside of their blades in long, longitudinal strokes. In combination with the diffusion film inside the blade, this forms what the company calls their Dual Diffusion blade style. The sanding is tremendously effective in bringing light out to the edges of the blade, but it is a little uneven in places and is also damage prone. After installing my blade in two different hilts, there are now two distinct rings near its base where the ends of the sabers’ emitters rubbed against the polycarbonate. If you’re planning to keep the Photon Blade exclusively with a single hilt, the rubbing isn’t an issue. However, if you intend to swap it around, be aware that the base of the blade will end up with visible rings from the various emitters. The sanding on the blade is rather obvious. It is also noticeable to some degree when the blade is on. Since the walls of the standard Photon Blade are only 1/16” thick, it isn’t a good choice for dueling. Folks who really want to beat the blades up should select the 1/8” walled, heavy grade version. Another thing to consider before dueling with the blade is just how easily my sabers’ emitters scratched the blade’s sanded finish. I have no doubt that sparring will produce even more noticeable damage. Vader’s Vault does not glue their diffusion film inside the blade. 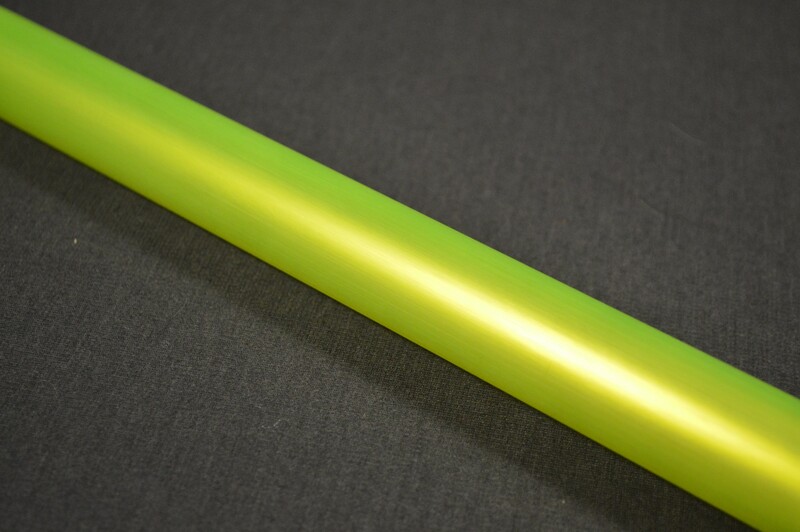 This allows the film to flex when the blade contacts other sabers or hard surfaces and prevents wrinkling. There is a small wrinkle in the diffusion film at the tip of my blade. This too can be seen when the saber is on, but it isn’t overly distracting. The Photon Blade is certainly an interesting product. While it won’t take a blue saber and turn it into a movie-green blade, it is certainly an affordable way to significantly alter the saber’s look. I would like to see Vader’s Vault increase the dye concentration in the blade for more consistent coloration and their sanding could use some work, both in terms of consistency and durability. Still, the Photon Blade is incredibly bright, even on single LED sabers, and I feel it is well worth the $45 price tag. I definitely want a photon blade. Videos on YouTube sure do capture a much brighter blade when the saber’s standard blade is replaced with a Photon blade.